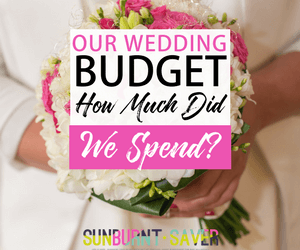 If you don’t over-think setting up your budget like I do, I am impressed! But if you’re anything like how I used to be, this post is for you. Since working professionally as a budget/finance analyst, I have learned a few master-level tips to setting up budgets. You will want to focus on fixed costs versus variable costs. This is really just a fancy way to say, when you set up your budget, you want to focus on things you absolutely must pay for (mortgage/rent, electricity, etc. ), fixed costs, versus things that aren’t absolutes (coffee budget, household expenses, etc. ), variable costs. When setting up your budget, start with how much you or you and your spouse (if you have a joint account) make monthly. Your monthly salary (which should include any ‘off’ money you make from taking online surveys or overtime at your job) is your starting point. This is where all of your budgeted expenses will be subtracted from. Let’s set up your budget by starting with all of your fixed costs. Based on my budget, here are things I absolutely must pay for, every month, or else. 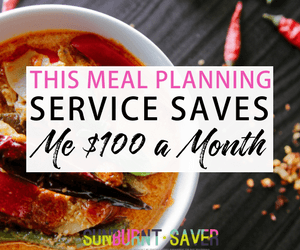 Try to make this list as short as possible – although we all need food to survive, your grocery budget probably has a little room in it, enough room to make it a variable cost. If some months you may have to eat more beans and less meat, while other months you can splurge and buy a $10 bottle of wine, your grocery costs are not fixed. Some may disagree that cellphones are a fixed cost, since some people could live without a cellphone and use a (not an affiliate link) VoIP service, but I need my phone for work, so I consider it a fixed cost. The next things you will want to evaluate when setting up your budget are your variable costs. One thing I will want to strongly caution you against when setting your budget is getting too specific. While it may seem like a good thing to do, your ‘personal’ category can quickly descend into ‘personal – household’ ‘personal – networking’ and the dreaded ‘personal – misc’. Whatever you do, try to avoid the heinous miscellaneous category. You’ll be surprised how, week after week, your miscellaneous category grows in amount until you have no idea whatever was miscellaneous in the first place. Think broad, not narrow. A few notes on some of these categories: my travel budget is small – around $25 a month unless I have a trip planned, then I increase it to account for what I plan to spend. I don’t spend $25 a month, but I ‘put’ $25 into this account to build up my travel savings. For the toiletries/Costco budget, we buy the majority of our toiletries (toilet paper, paper products, tissues) from Costco, which is why they go into the same category. If I buy groceries at Costco, which is rare, I put those amounts into the grocery budget. Household sounds like a miscellaneous category, and while it is somewhat of a catch-all, for me it means household upkeep expenses, like when B was remodeling the backyard, plus cleaning supplies for the house. Fun money/Date nights encompasses date nights, obviously, but also my $20 a month Starbucks addiction. For my fellow coffee addicts, yes, $20 a month is really low, but I supplant it by buying and making my own coffee. 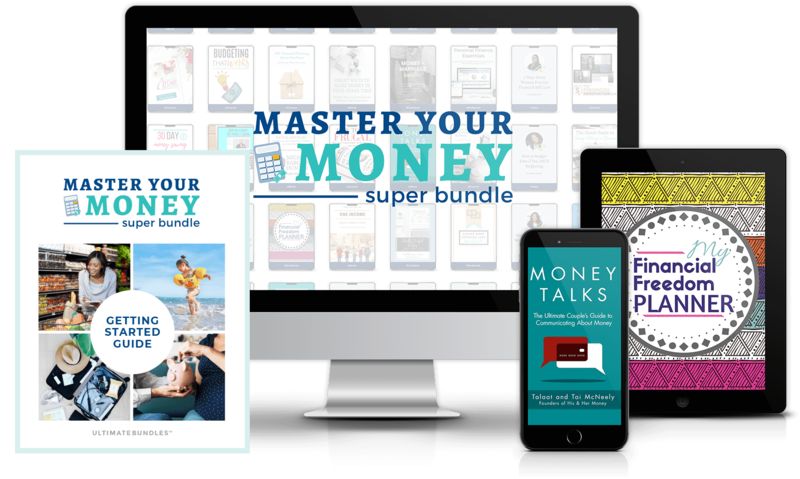 Feel free to use the categories I use for your own budget – you probably will have different categories than I do, especially if you have kids. Don’t feel guilty if you have more categories than I do, either! Everyone is different, and you may want to break down your expenses further. If you have a joint account with your spouse/SO, you may also have more categories that break them down further. B and I don’t have a joint account, so expenses like groceries are halved, since we take turns buying them. Now that we have categories set up for your budget, it’s time to plug in numbers. You may already have a rough estimate on what you spend monthly for groceries, but I’d advise against guessing. Collect all your receipts for a month, or two if possible, to get a good estimate on what you spend monthly. If you mostly purchase things on your card, like I do to track all my expenses, you can log in to your online account and go back several months to get a more accurate estimation of what you spend monthly. Be honest with yourself: if you spend $500 a month on groceries, don’t give yourself a budget of $250. Remember to subtract all of your estimated expenses from your monthly salary which, again, includes all ‘off’ money you make too, in addition to your regular job. If your salary doesn’t over all of your estimated expenses, it’s time to reduce some things. Reduce your ‘fun’ budgets, like fun money or gifts. If that’s not enough, maybe you can reduce household or personal expenses. Try not to reduce grocery or gas too much, unless you’re absolutely sure you could save money by cooking cheaper. If you’ve estimated well, you’ll notice sometimes there’s not as much room in your gas budget as you’d expect! 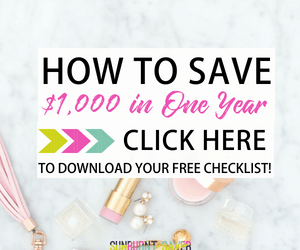 Try this budget for a few months, and let me know how it goes! 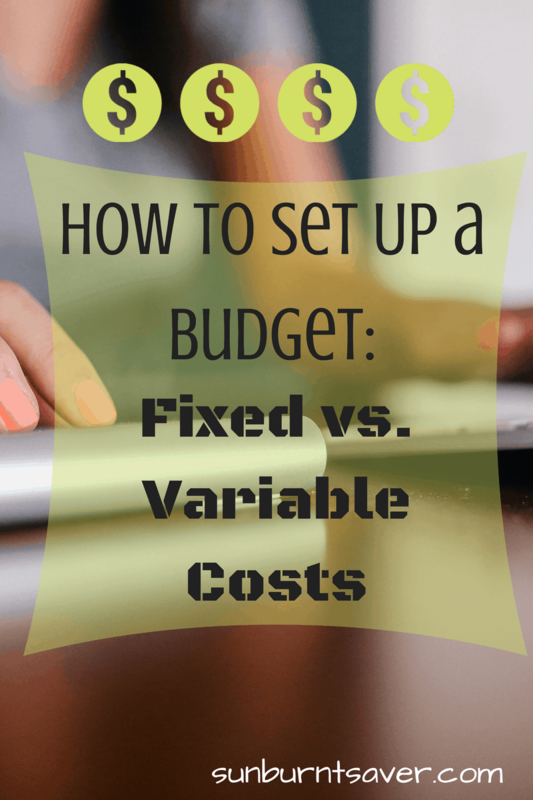 Setting up a budget doesn’t have to be hard or overwhelming as long as you think of your budget in terms of fixed versus variable costs. Have you set up a budget for yourself, and how did it or how is it going? How do you structure your budget? Like what you’ve read here on Sunburnt Saver? Keep in touch! Follow me on Twitter, Pinterest, and BlogLovin‘ to stay up to date on my latest posts, musings, and neat stuff related to personal finance I find. This is pretty comprehensive! I only just started *actually* budgeting a few months ago. Before that, I had an ideal amount of what to spend, but I would only track my spending at the very end of the month. Since I didn’t actively update it, I didn’t really have time to adjust anything in the middle of the month. I think my current way is working out better. Oh my gosh, that was me too. Updating it only once a month, while in theory a good idea, didn’t work out for me either. Maybe it’s just me, but I actually forgot about purchases made randomly during the month, and then I never balanced at the end of the month. Updating as I go, usually weekly, keeps me much more accountable. I’m glad you’ve found a way that works for you too! I think it is the struggle with variable costs that keep most people from really diving into budgeting.. However, it is worth the effort to go full-nut-budget for at least a month or two to make sure you aren’t spending more than you are bringing in. Only then can you know if you need to pick up more work or start slashing and burning expenses.. I am still amazed at the amount of people who truly have no idea. Oh absolutely, variable costs can get out of control quickly. Sometimes it’s hard to put expenses into one box, especially if it fits in one or more boxes. I really try to avoid a miscellaneous category as much as possible, but sometimes you do just need one. I think it’s that overwhelming feeling that keeps people from trying, but especially for younger people, our lives aren’t as complicated as older people & people with children, so now is the time to create a budget and adjust it as life changes.